It’s more like gladiator meets braveheart, political agenda and all, than any previous incarnation of robin hood, and that’s not such a bad thing. Director Ridley Scott and his longtime star and collaborator russell crowe decided to make an unusual version of the classic robin hood tale for their follow up to american gangster and body of lies. they got producer brian grazer on board who also produced gangster for them. then they got brian helgeland to write (the writer behind la confidential, crowe’s best film to date). with so many creative minds involved in the conceiving of this picture, it;s no surprise that it offers up a unique vision of the story. after all, who really wants to be involved in just making the same old thing we’ve already seen before? certainly not these guys. the original ideas for the movie, once these creative minds got together, were to make it about the sheriff of nottingham and maybe to tell his point of view and to treat robin hood as a sort of terrorist. He is a thief in every version of the tale, so why not treat him like one for once? the movie was going to be called nottingham. as this idea began to form, the writers decided they would have crowe play both the part of the sheriff and also the part of robin hood as well. they had the right drive and incentive to get creative, but were on the wrong path. and so they changed what they had and went back to square one. good decision. they stripped away that whole mess about telling the story of the sheriff, and instead got creative with the story of robin hood himself. this movie is like a prequel to every version of robin hood we’ve ever seen before. whereas the sean connerey version, robin and marion, is like a sequel, telling their story once they have reached an older age, this movie tells what happened before the man became the legend. So we really don’t see any of the robbing of the rich to give to the poor. some might call that sacrilidge to the story, claiming that the one fundamental idea that robin hood is all about is nowhere to be found in this movie. to them i say, would you rather just have the same old thing again? Because there really is no steam left in that story. Between the swashbuckling errol flynn version or the updated kevin costner version (everybody is down on this version, but i remember how popular it was and how much people loved it back in the nineties), we’ve got that story covered. ridley scott and his team decided to go another route for this movie. Now, when you look at ridley scott’s movies and what he does best, it’s very simple. large scale battle movies of epic feel. He’s the guy who directed gladiator to a best picture of the year oscar. He also made kingdom of heaven, which i haven’t seen, but have been told is very good. And I believe it. Even his black hawk down had that sense of urgency in battle (although not in the same medievel way as those other films). well, I’m glad to say that scott’s robin hood movie is right up there with those others, continuing along with what he does best. It’s got the battles and the epic scope and the political agenda and it really does feel like braveheart meets gladiator. That might sound like the movie is all action and just meant to cash in and even rip off those films, but one has to remember that aside from action, those movies had great story lines of standing up to tyraNny. In both of those movies there was a corrupt and evil king. In fact, in gladiator, much like in this film, the king was more of an immature boy than a man, spoiled and selfish and childish in every way. In braveheart we got the old man version of that character. 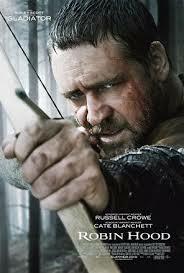 Ridley scott’s robin hood begins with great battles of the crusades. Scott’s agenda with this movie has a motivation of three prongs. The first is to make it a battle movie, just like scott’s other films. good choice. the second is to make it a prequel that would setup how the legend might have come to be. Also clever. And the third idea is to set the movie in real history, or at least pretend to, which is a pretty good decision as well. And so the movie opens during the time of the crusades when england is led by king richard the lionheart into the holy land of jerusalem to fight against the muslims. crowe’s character, robin longstride, even gets to offer up his commentary and opinion on the crusades to the king and it is less than flattering. and the king, being benevolent and understanding, merely has robin and his friends put in stockades for a small period of time as a result. any other king would have had them hung or beheaded. The movie begins with a great battle sequence that feels like it came right out of the beginning of gladiator where crowe took on the attacking german warriors. The scene involves archers, battering rams, blowing up a castle gate, flying dirt in the air, and swordplay on the ground. This is what ridley scott does best. the king is killed and crowe and his men come upon the dead bodies of the men who were taking the king’s crown back to england. they have been killed by godfrey (mark strong), the villain of the film who reports back to the new king of england but really has a secret agenda with the french. One of the killed englishmen is a man named Robert Loxeley. Crowe’s character, robin, decides that when he returns to england he will pose as this character and see if anyone notices. It’s a little ridiculous, and I’m glad that it doesn’t exactly work. Instead, robin meets the father of the dead man, played by max von sydow (so great in minority report and shutter island), and sydow has the idea to have robin pretend to be his son in order to help keep the land from being turned over. It’s all about property rights and while not everyone is fooled into believing robin is the man he claims to be, it works for the story. robin stays with robert loxeley’s widow, marion (cate blanchet) and as the movie goes on, they develop an inevitable little romance. There’s also a version of the friar tuck character who moonlights as a beekeeper, played by mark addy. I like the actor, from the full monty to a knight’s tale to his tv show “Still standing.” but here, in this movie his character is pretty pointless. He’s given nearly nothing to do. The movie is long and it might have been better if it had been about thirty minutes shorter, but I’m sure the great length (two hours and twenty minutes), was intentional. It’s meant to make the movie feel epic and it pretty much works. the movie could have also used a little more action. it seems like they tried to put action in where they could and had a hard time finding places to make it work in the plot. they should have tried harder. as it is, there are only about three major action scenes. there’s the battle at the beginning, the battle at the end, and then a fight in the middle when godfrey’s soldiers come and attack the loxeley estate. Robin and his buddies show up to fight them off and drive them away. The storyline, about godfrey having the king’s ear and the king turning on his people, is pretty good. especially since godfrey ends up double crossing him. 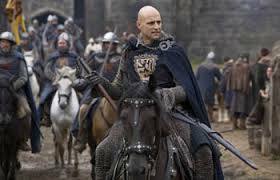 I like mark strong as the villain. He’s better here than he was as the villain in sherlock holmes (there he was a little too hidden and too scary, and here he seems like he could actually be a real person). Godfrey is probably the most interesting character in this film, and i’m glad he is given such a large role. the king and the sheriff of nottingham, on the other hand, are downgraded to smaller parts played by lesser known actors, and that is totally fine. we get a good, solid villain in godfrey and that’s really all we need. that combined with an interesting story about tyranny vs liberty and advisors like william hurt who worked for king richard and now see his work thrown down the drain by the new king, make for a worthwhile film. and the great action and battle sequences certainly help. I wish there had been more of them and that the movie had been a little shorter, but overall it’s a good and creative film and an interesting take on the legend.